U.S. Mail Supply is Texas’ leading distributor of commercial and residential mailboxes for sale online, boasting a deep inventory of heavy duty aluminum & steel manufactured indoor & outdoor locking mailboxes for apartments, offices, condos, classrooms, and much more. Shop modern surface and recess wall mounted mailboxes for your business. 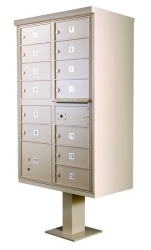 Easy installation and secure, lockable doors makes for an affordable, safe mail box for commercial applications. U.S. Mail Supply offers USPS Approved 4C horizontal mailboxes and 4C pedestal mailboxes for private delivery for sale online for Texas residents and businesses. Installation options for 4C horizontal mailboxes include surface mounted or recess wall mounted. The United States Postal Service puts restrictions on what is and isn’t an approved mailbox for USPS delivery. We offer commercial and residential mailboxes pre-vetted for USPS approval so you don’t have to worry about compliance. Shop vintage or Victorian style decorative outdoor cluster mailboxes for luxury or high end apartment buildings - or big, lockable & secure 4C horizontal lockers for the lobby. 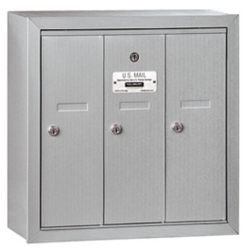 Your tenants will never question the safety of our durable steel/aluminum constructed apartment mailboxes. 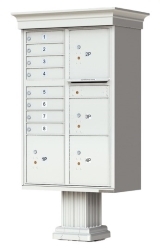 We offer a deep stock of outdoor pedestal cluster mailboxes, including large USPS approved F-series cluster mailboxes or 4C pedestal mounted mailboxes for private use. Best for multi-unit residences, apartments and other commercial applications. 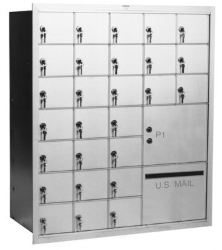 U.S. Mail Supply offers indoor horizontal and vertical mailboxes for apartment complexes, office buildings, new construction, condos, and much more. Check each mailbox type for USPS approval or private use status. Choose small decorative elegant column or wall mounted residential mailboxes for luxury apartments or high end residential homes. Option for post mounted home mailboxes available. We offer a wide variety of mail sorters and literature organizers for offices and mailrooms, including security mail sorters, vertical mail sorters, closed back steel mail sorters, open back mail sorters, and mobile mail sorters. U.S. Mail has an ever growing selection of residential mailboxes in stock to fit the style of any Texan home. 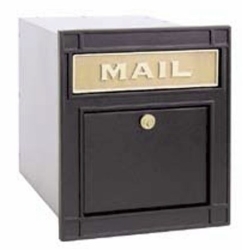 Our product line of residential mailboxes includes wall-mounted, post-mounted, and column-mounted mailboxes that come in an assortment of colors and finishes. 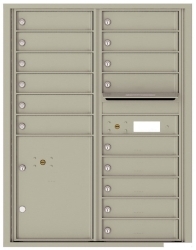 All U.S. Mail residential mailboxes feature locking capabilities to help keep your property secure. Longevity of any home improvement purchase is always pinnacle, and you can depend on the durability of our mailboxes for years to come. Spend for quality now to avoid spending for a replacement later, U.S. Mail’s residential mailboxes are crafted to fit your home’s style and built to last. As the premier supplier of mail and shipping room equipment and supplies in Texas, U.S. Mail Supply provides dependable mail sorters for your home or business’s mail organization. Fit to serve in any setting, whether a skyscraper’s mail room or a kindergarten classroom, our mail sorters are constructed to fit your organizational needs with security options to help ensure the safety of your property. U.S. Mail’s mail sorters are made of high quality steel and professionally welded to ensure dependable durability over the duration of its lifespan. 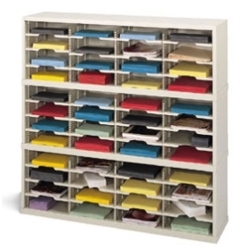 Our mail sorters adjustable shelves can be moved to fit an array of mail and personal items, coming in a variety of shapes and sizes from the sturdy 120” mail sorter to the space efficient 25” mail sorter. From open back steel mail sorters, to vertical mail sorters, to steel security mail sorters; U.S. Mail Supply offers numerous options ensuring we have the solution best suited to fit your needs. Cheap mailboxes can't compete with our tough metal mailboxes. U.S. Mail Supply offers american-made mail boxes built tough with aluminum and steel to stand up against the test of time and heavy use. Don't waste your money on cheap pretenders - go with heavy duty metal mailboxes and get peace of mind. Choose vertical or horizontal pedestal or recess wall mounted mailbox units for your multi-unit building—or single residential wall mounted mail houses. U.S. Mail Supply offers USPS approved or private delivery mailboxes depending on your application. Let us know if you have any questions about what kind of mailbox is perfect for you. 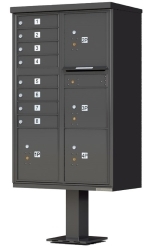 U.S. Mail Supply offers customization options for standard indoor horizontal mailboxes, 4C horizontal mailboxes and cell phone lockers. Enter your number of tenants or slots needed, finish type, front or rear loading option, door sizes, door lock type, number of parcel lockers for packages, personalized door identification, and much more. We’ll quote you on the perfect horizontal mailbox or cell phone locker built to your exact specs. © Copyright 2019 U.S. Mail Supply, All Rights Reserved.